Little Rock City Hall is located at 500 West Markham Street, Little Rock, AR 72201; phone: 501-371-4590. 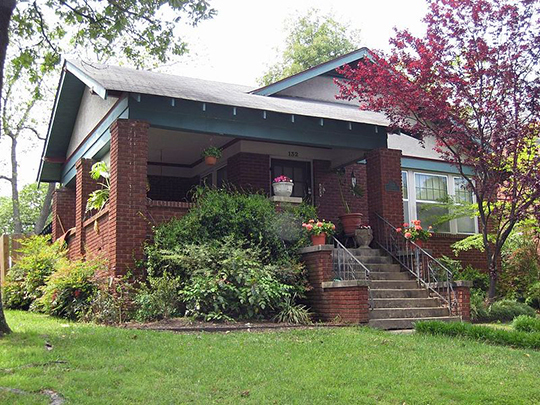 Photo: Home in the Capitol View/Stifft's Station neighborhood, Little Rock, AR. Photographed by User:Bruce W. Stracener (own work), 2008, [cc0-by-1.0 (creativecommons.org/publicdomain/zero/1.0/deed.en], via Wikimedia Commons, accessed January, 2014. Little Rock was first settled in the 1820s, beginning at a site near the north end of the Historic core along Main Street. Hiram Whittington, a young printer from Boston, described Little Rock in 1826 as a town containing "60 Buildings — 6 brick, 8 frame, the rest log cabins. The best brick building is the one occupied by the paper and is as good a one as you will see in Boston." The newspaper mentioned in Whittington's letter was the Arkansas Gazette, the first newspaper in Arkansas and the oldest west of the Mississippi. For the first several decades of the town's existence, commercial activity was concentrated along the riverfront on Markham Street. Orientation to the river became less essential by the 1870s, when railroads supplanted riverboats as the primary means of commerce. The influx of northern capital, as well as the arrival of the railroad, made possible a tremendous building boom during the late 19th century. The business district grew rapidly southward from Markham along Main Street. By 1880 the density and scale of the business district dramatically increased, replacing most of the streetscape of the pre-Civil War period. The mercantile area of the historic downtown area was among the first in the state to acquire "modern" conveniences and improvements, such as paved streets, public lighting, piped gas and water, and fire protection. In 1840 there were fewer than 2,000 inhabitants in Little Rock; by 1860 the number had only grown to 3,727. Although little of the appearance and atmosphere of Little Rock's 19th century downtown remains intact today, two significant features are still visible. One, the street plan, originally established in the 1820s and reinforced by the public improvements of the 1880s. Two, the tightly-packed arrangement, if not the stylistic appearance of the business structures lining Main Street remains largely intact. As the center of the state's largest commercial and retail district, Main Street was universally regarded as the most significant thoroughfare in Arkansas during the early 20th century. The state's agriculturally based economy began to suffer in the mid-1920s and, when the Great Depression struck the nation in the 1930s, the construction boom on Main Street ended. Many banks failed and seemingly healthy businesses were forced to close. Main Street was still the center of commerce, but the noise and excitement associated with it were much reduced until after World War II. Ralph Megna and Julie Wiedower, Downtown Partnership, Little Rock Main Street Multiple Resource Area, nomination document, 1985, National Park Service, National Register of Historic Places, Washington, D.C.